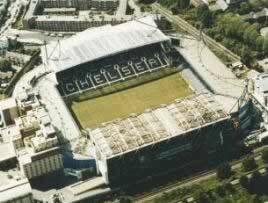 Stamford bridge currently holds 44,000, and includes a hotel, luxury apartments, and five restaurants. Away fans have the option of taking one or two of the sections in the east stand lower. If they only take one section they get 2,200 tickets but if they chose both sections they get just over 4,000 tickets. The ground itself is quite modern, and the facilities are excellent. The Matthew Harding Stand holds 12,000 people with the upper tier being all season tickets and the lower being season tickets and members. The lower holds roughly 7,600 and the upper holds around 4,400. The East Stand holds around 12,600 people with the lower tier holding 4,000, the middle tier holding about 2,600 and the upper tier holding around 6,000 people. The Shed End holds 6,900 people with the lower tier being all family season tickets and the upper for non-members. The lower holds 2,500 people with the upper holding 4,400 people. There is a superstore, called 'The Chelsea Magastore' (0871 984 1955) selling all the memorabilia you could think of. There are also two jumboscreen that show match highlights, interviews, and scores from other games. The stadium tours run 3 times a day, 7 days a week. Tours run at 11:00, 13:00 and 15:00 although it's best to check first to ensure a certain tour is running. They are available 7 days a week, to individuals, groups or school parties. Stamford Bridge is the most central of the London grounds and is easily accessible by tube or bus. Use the M25 to take you round to junction 15 and turn off onto the M4 towards London, follow the M4 which becomes the A4 up to Hammersmith. Stay on it over the Hammersmith flyover and for a further 1.5 miles before turning off for Earls Court. Go past Earls Court station and down the one way system until you hit Fulham Road, turn right at the traffic lights. Go straight on for 600 yards and the ground is on your right. Parking is difficult very close to the ground so you may want to look a bit further away. Head for Wandsworth bridge to cross the river. If using Wandsworth bridge, cross the river and head straight up Wandsworth Bridge Road. At the Junction with New Kings Road turn right and then immediately left. This will take you up to Fulham Broadway, turn right onto Fulham Road and the ground is 400 yards on your left. Parking is difficult very close to the ground so you may want to look a bit further away. There are two tube stations that are within walking distance. These are Fulham Broadway, and West Brompton. There is little free parking near the ground. It is mostly pay-and-display or residents only. The ground has an underground car park for ?20 per car but there is no access after 2pm. This ground, like most of the London grounds, has very limited parking, and it's advisable to park away from the ground and then travel by tube. This is a popular pub, that can be found at the North East corner of Parsons Green. Leave the Parsons Green tube station using the right hand exit. As you exit the station turn right and walk 50 yds down the road to the White Horse on the left hand side. The Slug and Lettuce is a modern pub, part of the Slug and Lettuce chain of bars, and is probably the best pub for away fans. They serve basic pub food and have a good range of beers on offer. It's located just Fulham Broadway station, and only a few minutes walk to the ground. Like all good football pubs, it gets very busy, so arrive early. Pulse is a modern, lively bar located on Kings Road. It serves authentic Thai cuisine and a good selection of beers, and also boasts two plasma screens and Sky TV. Walk past stamford bridge along the Fulham Road, go over the railway line, first foad on the right (private road) pub is down on right. This is a real gem, looks like it hasnt changed since it was built (the public bar on left) small and snug, serves greene king ales in good condition. Rear beer garden covered, a good crowd on matchdays no trouble. The Sofa So Bar is directly opposite Stamford Bridge, and is the closest bar to the gound. On match days the atmosphere is something very special. Get there early (opens at 11.00am) - we get exceptionally busy, with satellite bottle bars and a burger bar (all big, fat and home-made) just to cope with demand. We are open until 6.30 PM (saturdays) for the after-football crowd but then close in order to re-open for the evening set at 8.00 PM. If you are a registered user then you can login, and create your own personal review of Chelsea Football Club - Stamford Bridge. These reviews can be private or public.